S’mores are on my mind. The combo of crisp crackers, gooey marshmallows, and dark, rich chocolate not only taste delicious, but they remind me of the summer. And boy, am I looking forward to summer! Since I won’t be able to roast marshmallows over an open fire any time soon, I thought I’d make these S’more Sandwich Cookies. 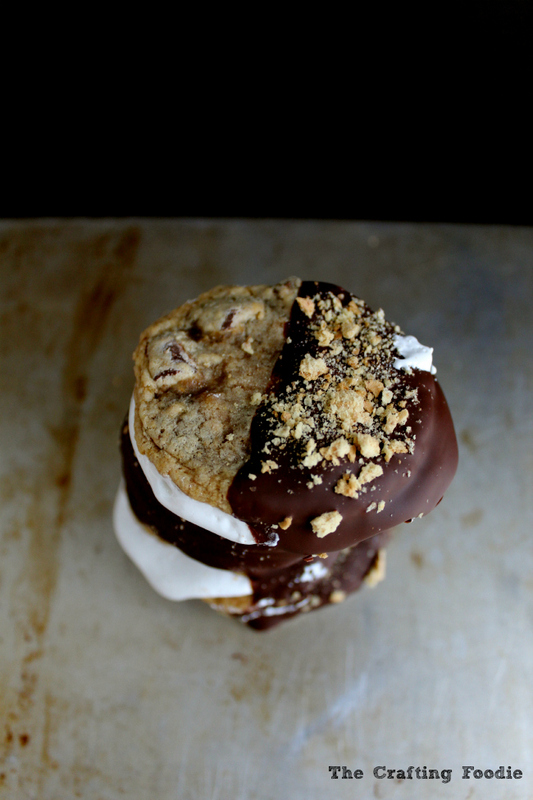 These S’more Sandwich Cookies start off with two cookies filled with graham cracker crumbs and chocolate chunks. They’re very much like chocolate chip cookies except some of the flour is replaced with crushed graham crackers. It gives the cookies a distinct graham cracker taste, and the chocolate in the cookies provides that classic chocolate flavor to these s’mores. For the marshmallows in this treat, I decided to go for marshmallow cream. You could make your own homemade marshmallow filling by whipping up a batch of Swiss meringue buttercream (minus the butter), but I decided to go for a delicious and easy option by using the jarred cream. The softy, gooey marshmallow cream acts as the perfect balance to the crisp, graham cracker cookies. And to add another layer of chocolate to these s’mores, I decided dunk the S’more Sandwich Cookies into some bittersweet melted chocolate. The high cocoa content in the chocolate balances the sweet filling, and the chocolate coating gives the cookies a pretty finishing touch. So there you have all three components of classic s’more – graham crackers, marshmallows, and chocolate but each part of the cookie is tiny departure from the classic s’more. When creating these cookies, I poked around my favorite blogs for inspiration, and I came across these delicious Chocolate Mallow Cookies from Organized Island. If you’ve never visited Organized Island, you definitely should. Raquel, the creator of Organized Island, shares so many creative DIY projects, recipes, organization tips, and she also wrties about her travels. It’s like a one-stop blog for those of us with busy lives who want to read a little bit about everything! Using Raquel’s Chocolate Mallow Cookies as an inspiration, I put my own twist on a classic s’more by turning it into a sandwich cookie. 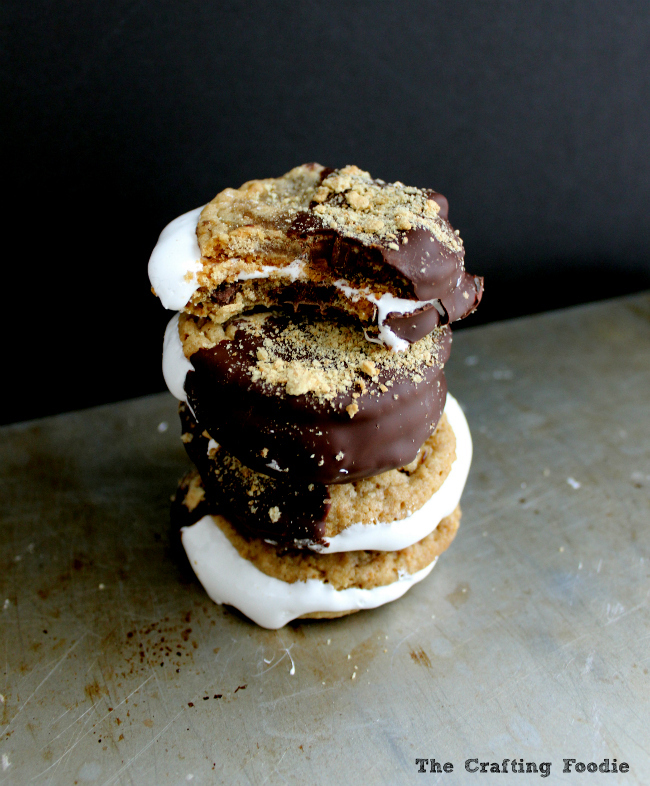 So, until the weather warms up and I can roast marshmallows over an open flame, I will indulge in these S’more Sandwich Cookies. Even more than cooking outside, when warm weather finally arrives, I’m the most excited about going for a run without winter gear. What are you looking forward to as the weather warms up? 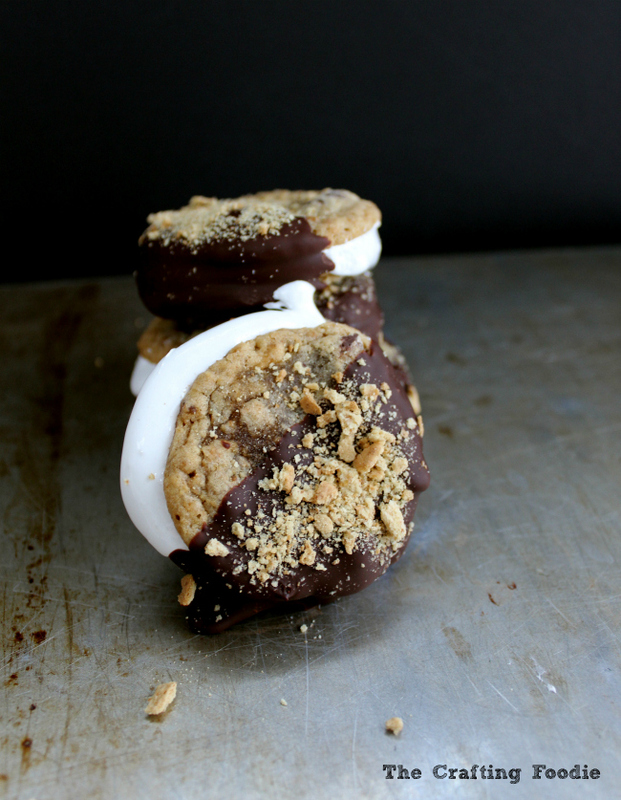 These cookies are a delicious twist on a traditional s'more. They're two graham cracker cookies studded with chocolate chunks and filled with marshmallow cream, and the entire sandwich cookie is dipped in bittersweet chocolate and sprinkled with graham cracker crumbs. In a medium bowl, mix the graham cracker crumbs, flour, baking soda, and salt. In a large bowl, using a wooden spoon, cream the butter and brown sugar until light and fluffy. Add the vanilla and egg to the butter mixture. Mix until combined. Measuring out balls of dough using a tablespoon, place cookie dough balls on a parchment-lined baking sheet. Place the balls about 2 inches apart. Once the cookies are removed from the oven, using an oven mitt covered hand, slightly press down the cookies until they are just flat. Allow the cookies to cool completely on a drying rack. Once the cookie are completely cooled, spread about 1 tbs of marshmallow cream on half of the cookies. Place another cookie on top of the cream to create the sandwich. Place the filled cookies on a baking sheet and chill in the fridge for about 20 minutes. While the cookies chill, melt the chopped chocolate and shortening until smooth. Dip half of the cookie in the melted chocolate and immediately sprinkle with with graham cracker crumbs. Place in the fridge to set the cookies. Oh Aida, now you have me craving some smores as well! These look fantastic! Thank you for sharing on Weekend Bites. Hi there! Visiting from Mix It Up Monday. This looks delicious! Your photos are great too. Thanks so much for sharing the recipe! I want Some-More! These look AMAZING Aida! So summery I can’t! Pinned! Thanks so much Tonya! I love your punny comments (yes, I know, that was a horrible pun!). I’m obsessing over summer treats because I can’t wait for warmer weather! 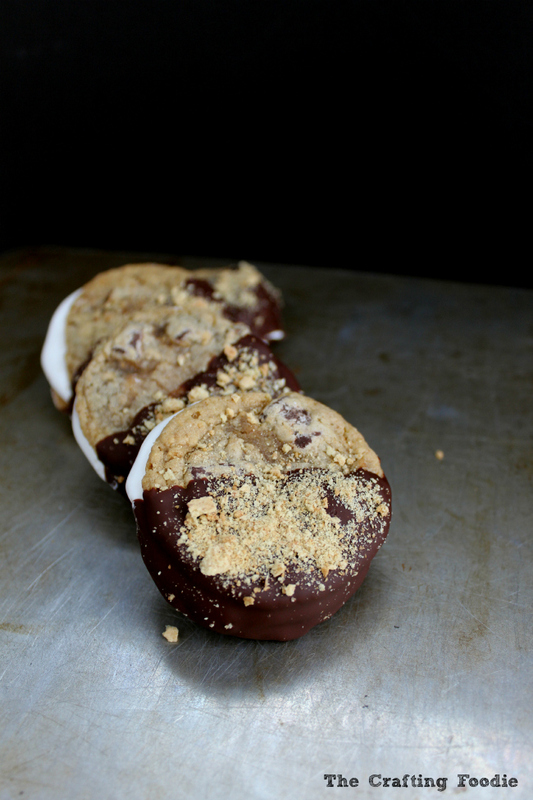 I adore adding a s’mores twist to just about anything I can!!! This is such a fun cookie! I love that you dunked the whole cookie sandwich in chocolate and crumbs!!! So fun! Aida, these are absolutely amazing!!! I am so craving now. Love the graham cracker crumbs in the recipe. Oh oh oh. So decadent! Your cookies look amazing. I love s’more anything! These are pretty much complete awesomeness. 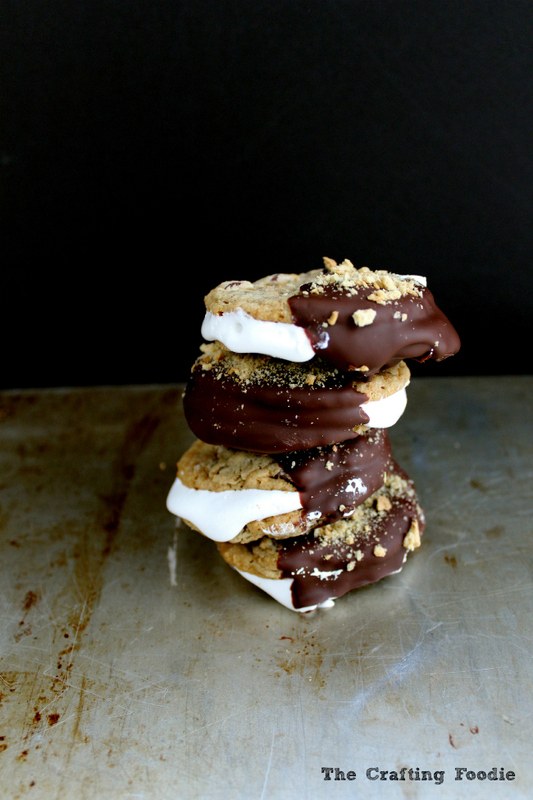 Totally my kind of s’mores! Thanks so much Aimmee! Unfortunately, I haven’t met a s’more that I didin’t like!